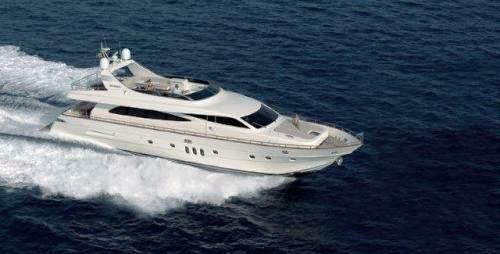 Motor yacht KARISMA is a Canados 86, measuring 26,48m (86' 10"). 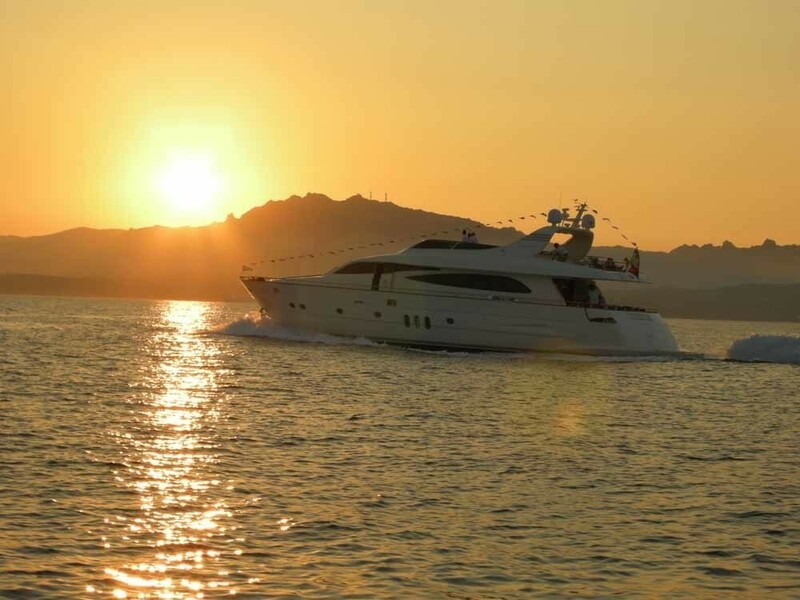 The 2008 built charter yacht can accommodate up to 8 guests and is based in Rome and or Sardinia available for charters throughout the Western Mediterranean. The Canados 86 combines refined customized interiors an elegant external line destined to last over time and a hull that is reliable and efficient in all sea conditions. M/Y KARISMA’s main deck and her fly deck offer large spaces extending without interruption, where the areas are divided according their use without rigid separating elements. 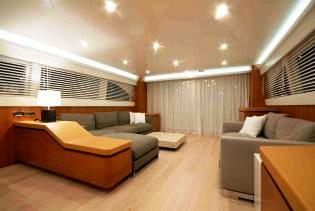 Motor yacht KARISMA has refined custom-made interiors and carefully thought out fittings. 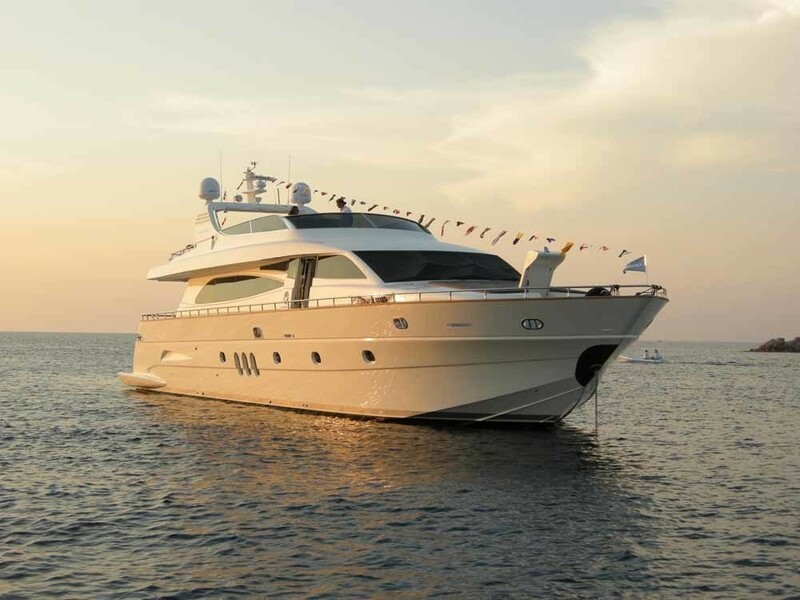 The Canados 86 KARISMA main deck interior layout includes a living area, dining area, and galley, a day head, and pilothouse. On the lower deck there are 4 cabins with 4 private heads. 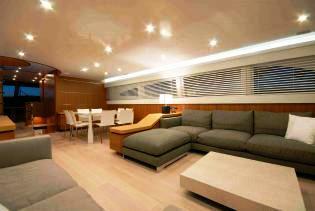 The full beam owner’s suite extends across the full beam in the centre of the boat, which receives light from the large vertical portholes, three in each bulkhead. 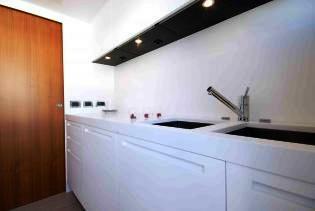 The suite has a walk-in wardrobe and bathroom with rectangular shower, stereo CD system, 17” television, DVD and air conditioning. 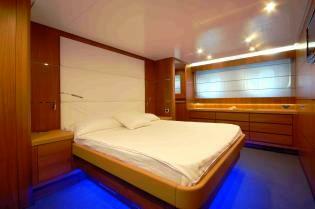 Guests have a VIP cabin in the bow and two further cabins, each with twin beds and a third, optional Pullman bunk. 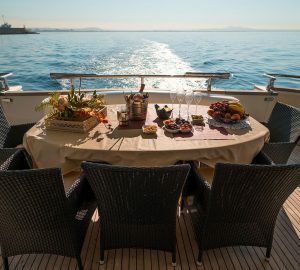 The aft deck is panelled in teak and is the perfect area for breakfast, an aperitif or al fresco evening meals. The oval table seats eight guests comfortably. 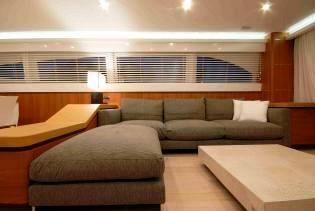 At the bow there is a spacious area to laze in the sun, alone or with friends, on soft water-repellent cushions. The area for manoeuvring the anchor, equipped with an electric windlass of 3500 Watts with remote remotely controlled, does not interfere with the sunbathing area for relaxation and sunbathing. 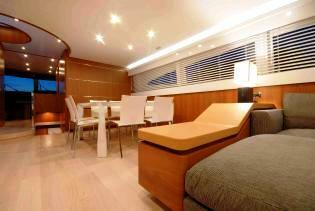 The Canados 86 KARISMA has a fantastic sundeck with dimensions of which are usually only found in larger sized yachts. Charter yacht KARIZMA has twin 1342 hp engines enabling her to attain a cruising speed of 2 knots with a top speed of 30 knots. 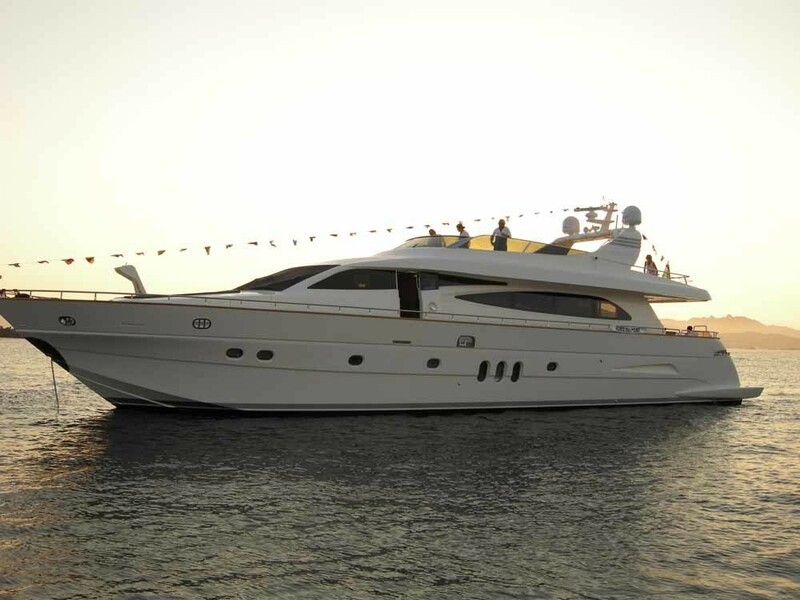 Luxury motor yacht KARISMA can accommodate up to 8 guests in 4 cabins on the lower deck. 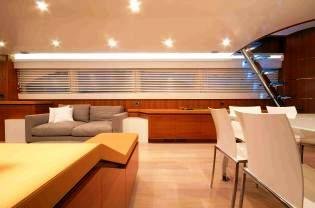 The full beam owner’s suite extends across the full beam in the centre of the boat, which receives light from the large vertical portholes, three in each bulkhead. The suite has a walk-in wardrobe and bathroom with rectangular shower, stereo CD system, 17” television, DVD and air conditioning. 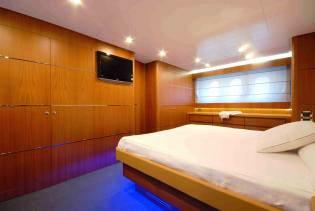 Guests have a VIP cabin in the bow and two further cabins, each with twin beds and a third, optional Pullman bunk. 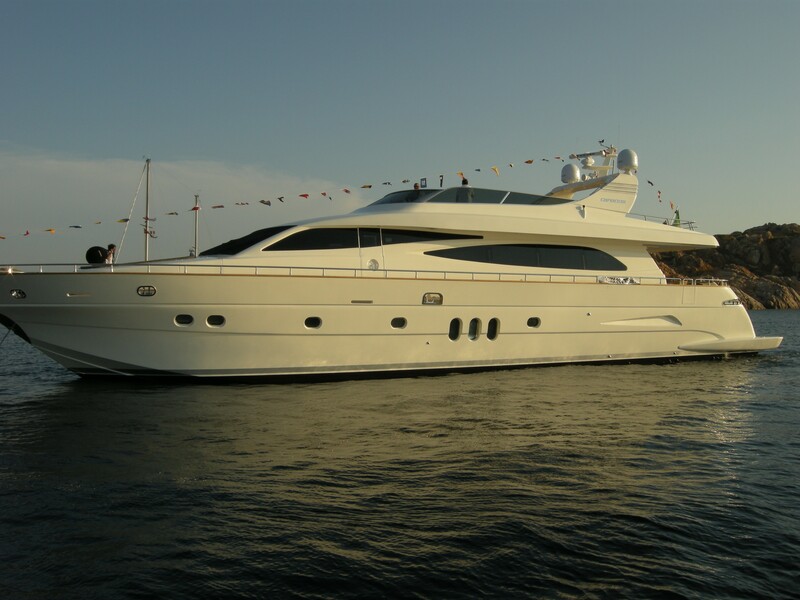 Motor yacht KARISMA has the following extras onboard: A Williams 325 Turbojet tender and audio system and DVD in all cabins. Contact CharterWorld for further information.